The 2017–18 season has been the strongest to date for NZDRA, with around 235 licence holders competing in the NZDRA National Championship Series around the country, culminating in a record 217 entries at the 50th Nationals held at Masterton Motorplex in March. Motueka had its most successful National round ever, with 71 entries for their 25th Anniversary season, while 111 racers entered at Taupo, and Tokoroa had a great showing after a bout of bad weather kept some long-distance racers away. The NZDRA National Series is run over five events at four tracks — Amisfield Airstrip in Tokoroa (Group 3 only), Bruce McLaren Motorsport Park in Taupo (Groups 1, 2, and 3), Masterton Motorplex (Groups 1, 2, and 3), and Motueka Airstrip (Groups 2 and 3). The Nationals is generally alternated between Taupo and Masterton. Each racer receives entry points, qualifying points, and then round points. These points are allocated to the vehicle that has entered the event, allowing race teams to field more than one driver. Coming into the 50th Nationals, there were a few race divisions that were tight at the top of the points table. With the Nationals title up for grabs, along with the National Series Championship, the competition was fierce. Supercharged Outlaws had three points separating the ‘Green Go’ front-engined dragster (FED) of Kendal Smith and the Willys coupe of Mark Gapp. After qualifying in the number one spot, Gapp had his work cut out for him with a full transmission rebuild required on the Saturday of the Nationals — however, Smith held on and stretched his lead to take out the Championship title. Taking the Title of 50th National Winner, though, was J.D. Shepherd — won on a holeshot reaction against the indomitable Rivers Family Racing team. Running ETs of 7.05s against 7.07s, respectively, it doesn’t get much closer than that!! Top Alcohol fielded eight entries from as far south as Invercargill, however the rate of attrition was enormous, with only five making it to the first round, and Dwane Garrett the lone survivor to go through to the finals. Well-deserved Championship honours went to the Upper Hutt Glass family team of Paul, Michelle, Aaron, and Steven Davison; with Bryan ‘Stormin’ Norman, and Dwane Garrett runner-up and third, respectively. Super Stock had nine competitors over the series, but the standout of the Championship was third-place winner, Dave Downer, in his twin-turbo V8 Toyota Supra. With minimal crew, Dave took on the whole series, attending Taupo, Motueka, and both meetings at Masterton. He finally got his wish at Motueka, being honoured with the title of Best Burnout — the main criteria of which is to smoke out the race caravan, which he did … and then some! Sedans at 200mph are always a crowd favourite, and Top Doorslammer delivers the goods. Barry Plumpton did not disappoint, with a win over crowd favourite Nigel Dixon, and that is how their Championship ended up, with Taranaki’s Jeff Dobson rounding out the top three. Drag racing’s favourite double act of Gary ‘Grease’ Martin and Andrew Rea took out top honours in the Competition division, with a 7.83-second pass over the 7.90 of the beautifully-presented Panhead FED of Arran Brattle and Pauline Lane. Grease and Andrew are Life Members of the Association, and it was fantastic to see them back on form. Super Sedan had the biggest field ever with 50 entries, and Kurt Goodin fought his way through the massive field to take out the top spot with an on-the-money 9.66s in the stout Nova. However, it was Steve Carlsen, Aidan Crook, and David Thelin who took overall Championship honours. The Competition and Modified Bike divisions have been growing every season, and the camaraderie between these riders definitely shows in the pits. Sharing tools and parts has always been part of the drag racing family style of racing, but seeing riders help another competitor out — pulling all the parts together and lending some manpower so he could continue racing, was brilliant. Comp Bike top honours went to Shannon Webb, over Nelson Drag Racing Association President Karl Dykes, and although Tony Gray won over Alan Thoreson in the final of Modified Bike to claim the 50th Nationals Champion title, Alan was able to clinch the Championship title. 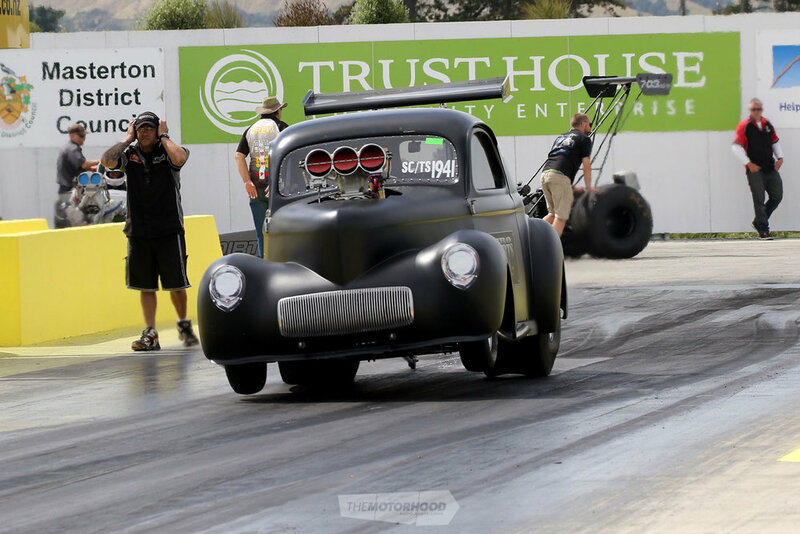 As one of the fastest-growing classes in the NZDRA line up, Junior Dragsters fielded 23 entries, so it was always going to be tough to get through the field. Blake Davies took the win over Ben Condor, but no-one could touch Victoria Steiner who held onto her points lead to be this season’s Champion over Brooklyn Hedley and Connor Smith. Super Street is always hotly contested, and this season was no different. Taupo Rod & Custom Club members Dean Hastie and Steve Amrein were constantly swapping places in the top three Championship positions with Wellingtonian Shane Cunningham, but they couldn’t keep the little Toyota Starlet from the top spot, finishing with second and third respectively. Rounding out the Series is the Modified division. Showing that in order to place you must attend all the National Series events available, Paul McLeod, Andrew Neiman, and Kevin McHardy completed their season at the top of the heap. The NZDRA Annual Awards Night and Dinner will again be held at Westpac Stadium, on 30 June, and will be joined by a very important guest speaker — Australian Top Fuel stand out Kelly Bettes is this year’s guest speaker, and is sure to give inspiration to the teams, supporters, and sponsors in attendance. Haven’t got your tickets yet? Contact the NZDRA office for more information at nzdra@xtra.co.nz.